Fresh, local produce featured at Eat'n Park for the week of July 29, 2013. At Eat’n Park, we’ve made a commitment to helping children and their families make healthier choices. One of the ways that we do that is through volunteerism. Read on to see how Jamie Moore, our Director of Sourcing and Sustainability, shared his talents with a group of local students. One of the organizations that I actively volunteer with is called Slow Food Pittsburgh. They recently partnered with the Phipps Conservatory and Botanical Gardens on assisting with hands-on cooking classes for their high school interns through a program called "Learning for a Greener Future". Cooking is a great life skill that these young adults can take with them as they grow into independent adults. I was excited and honored to be one of their instructors for the afternoon. On July 11, I got a chance to teach the young adults some simple but useful cooking techniques with a recipe that will wow their friends. I decided to teach them how to make a veggie hoagie that utilized the following locally grown vegetables: zucchini, yellow squash, eggplant, tomatoes, lettuce and red peppers. Since these students are going to be heading off to college or starting a place of their own, I made sure that I showed them ways to save money when cooking. One of the cost-cutting ideas I showed them was how to roast a red pepper versus purchasing them already roasted. It’s so easy - all you need is a gas stove top or a grill. Simply put the pepper on the open fire or grill and continue to turn until the pepper is charred black. Place it in a paper bag and let sit until its cool. Once cool, the skin from the pepper can easily be pulled off. After all of the veggies were sliced and roasted, we assembled the hoagies by layering the vegetables onto a large loaf of ciabatta bread. Once all of the vegetables were on the sandwiches, I showed the group how to make homemade vinaigrette, which is another cost-saving option. After the hoagies were done we sat together and enjoyed them as well as an awesome carrot zucchini cake that Alyce Amery-Spencer a member of Slow Food Pittsburgh made the night before. I enjoy teaching young people how to cook because it’s an essential skill that they won’t forget. Plus it aligns with Eat’n Park’s LifeSmiles program, which aims to empower both children and their parents to make healthier choices. Below is the recipe for these hoagies. Enjoy! Slice the first 5 items according to the instructions above. Add the sliced squash, eggplant and yellow squash to a large bowl and toss with olive oil, salt, pepper and thyme. Arrange these vegetables on sheet trays and roast in the oven for 15 minutes, flip vegetables over half way through roasting. Set aside until assembly of the sandwich. In the meantime, prepare hummus and vinaigrette (recipes below). To roast the red peppers, first wash and dry them. Turn one burner on the stove and place pepper in the center. Continue to char the pepper until they are 80% blackened. Place charred pepper inside of a paper bag. Let set for 10 minutes. Remove the charred skin and seeds and slice into ½” strips. Slice ciabatta bread in half long ways. Spread hummus on the bottom half of the bread then layer with sliced onion, zucchini, eggplant, yellow squash, cheese and red peppers. On the other half of bread, spread Dijon mustard then tomatoes and lettuce. Drizzle vinaigrette over the lettuce and place on top of the bottom of the sandwich. If you’re going to toast the sandwich in the oven don’t put the top with the lettuce and tomato on until after. To toast sandwich, turn on broiler and broil for 5 minutes or until cheese is melted. Slice sandwich into 4 or 6 slices. Last fall, we announced our support of a new initiative aimed at improving the health of our area’s children by mobilizing and motivating our community. FitUnited, launched by The United Way of Allegheny County, was a natural fit (no pun intended) with our goal of creating a healthier future for our children. FitUnited brings together like-minded organizations to support this objective through education and outreach. How? By encouraging healthy eating at youth-serving organizations, increasing awareness of how to choose and access healthy foods, and increasing physical activity, for starters. And who better exemplifies physical activity than our own Pittsburgh Pirates? This video, featuring Pirate Neil Walker and his teammates, illustrates just how easy it is to be a healthy role model for kids. To learn more about FitUnited, click here. Hi friends! 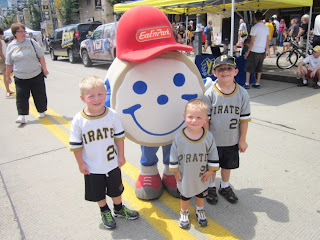 It’s Smiley, and last weekend was an eventful weekend that consisted of a parish festival, a walk supporting epilepsy, and the pre-Pirates game Kids Day at PNC Park. On Tuesday, Team Smiley and I were invited to attend the WPXI Skylights Media Day at Heinz Field. Football teams, cheerleading squads, and marching bands from around the Pittsburgh area gathered together for a collective pep rally! We, of course, were the cookie suppliers of the event! I was able to do so many fun things while at Heinz Field. I hung out with my friend Sarah Marince and I met football great, Hines Ward and 96.1 radio hosts, Mikey and Big Bob. Not only did I visit with these smiling faces, but I met a bunch of football players and cheerleaders who had just as much pep as I do! The highlight of the day was having a role in the commercial that will be airing soon to promote the upcoming Skylights football season. With the camera on us, Sarah and I sung and danced together on the field. Keep an eye out for the commercial! I am so excited to be a part of this WPIAL football tradition. I can’t wait for the season to begin so I can cheer on my favorite teams! It’s hard to believe that our endless Soup & Salad Bar has been around since 1978. What can we say; guests love our fresh-cut fruit, homemade soups, and abundance of salad bar toppings! But we wanted to make our Salad Bar even better – so let me introduce you to our new Soup, Salad, and Fruit Bar. Let’s start with our lettuce choices. We now feature three different types of lettuce every single day. Choose from mixed greens, or alternating spinach, Romaine, and spring mix. But we didn’t stop there. We have two new salad dressings: Red Wine Vinaigrette and Citrus Lime Vinaigrette. Give them a try – they are both light and refreshing options! You can also enjoy our new homemade prepared salads that will be rotated throughout the week. Waldorf Salad (Sundays) – First presented at the Waldorf Astoria Hotel in 1893, this salad is made form apples, grapes, walnuts, celery, and mayonnaise. Couscous & Black Bean Salad (Mondays) - A staple in Mediterranean diets; coarsely ground semolina wheat pasta formed into tiny pasta “grains”. Tossed with fresh diced tomatoes, black beans, peppers, and citrus lime vinaigrette. Tomato & Cucumber Salad (Tuesdays) - Fresh local tomatoes and crisp cucumbers tossed in Italian dressing. Grilled Fresh Marinated Vegetables (Wednesdays) – Zucchini, mushrooms, and onions all sliced, marinated, and chargrilled to perfection. Couscous Salad (Thursdays) – A staple in Mediterranean diets; coarsely ground semolina wheat pasta formed into tiny pasta “grains”. Tossed with roasted sweet potatoes, garbanzo beans, red peppers and raisins. Macaroni Salad (Fridays) – A classic salad sure to be a favorite! Potato Salad (Saturdays) – Just like Grandma’s Fourth of July salad…made fresh every day! And as always, we have an abundance of fresh hand-cut fruit, homemade soups, and housemade breads on our bar. Are you hungry yet? Hello friends! It’s Smiley here, and I hope you are keeping dry in this rainy weather! Despite the bad weather over the past few days, my team and I had a nice, sunny weekend to conclude Eat’n Park Family Week at the Pittsburgh Zoo and PPG Aquarium. All throughout the weekend, Zoo guests stopped by our tent to celebrate my birthday, play games, and of course, eat Smiley Cookies! Our festivities started on the Fourth of July. My team set up at the entrance of the Zoo to greet guests on Independence Day, and we celebrated with patriotic temporary tattoos and an abundance of cookies. I also enjoyed a dance party and photo opportunities with the Zoo’s Shark mascot! On Saturday, we helped the Zoo celebrate Underwater Adventure Day. This meant that I got to hang out with my Shark friend again at the PPG Aquarium and the Eat’n Park Beach Party, which was a lot of fun. I saw the live sharks from the underwater tunnel, and I even posed for pictures next to a giant polar bear statue! Finally, on Sunday, we arrived at the Zoo to give guests Smiley Cookies for the road. We had fans from near and far stop by for cookies, ranging from Zoo employees to one family that was visiting all the way from Canada! We even had guests drive by our tent for curbside cookie distribution. Overall, we had a great time celebrating Eat’n Park Family Week with our fans at the Zoo! We care about our team members and their education, which is why every year we grant over $50,000 in academic scholarships to students who are working for us. We recognize the importance of education in our communities and we believe that making an investment in our team members is essential to the growth of our company. Hey guys! It’s Smiley here, and I am having such a fantastic time celebrating Eat’n Park Family Week at the Pittsburgh Zoo and PPG Aquarium! Aside from hanging out with my super cool animal friends, I have also made time to hang out with some of my favorite people, Pittsburgh Pirate fans! Every Sunday Pirate-home-game on Federal Street is Kids Day, an afternoon dedicated to all-things kids. There are so many fun activities including face painting, moon bounces, autograph signings, balloon artists, and on selected Sundays, Eat’n Park Smiley Cookies! Guests of all ages can check out my Cookie Cruiser and decorate their very own Smiley Cookie! I love seeing the different designs people decorate their cookies with. They always look so delicious! Another thing I love about hanging out on Federal Street are all the fans. I love seeing everyone decked out in their Pirate gear, especially the little Bucaroos! But you know that I also love the music. These two guys play guitar and sing popular songs at every home Pirates game, and let me tell you what- they are AWESOME. They were so good that I tipped them in Smiley cookies! I can’t wait until our next visit on July 14th. I just love hanging out with the fans, and my BFF, the Pirate Parrot, and cheering on the home team!